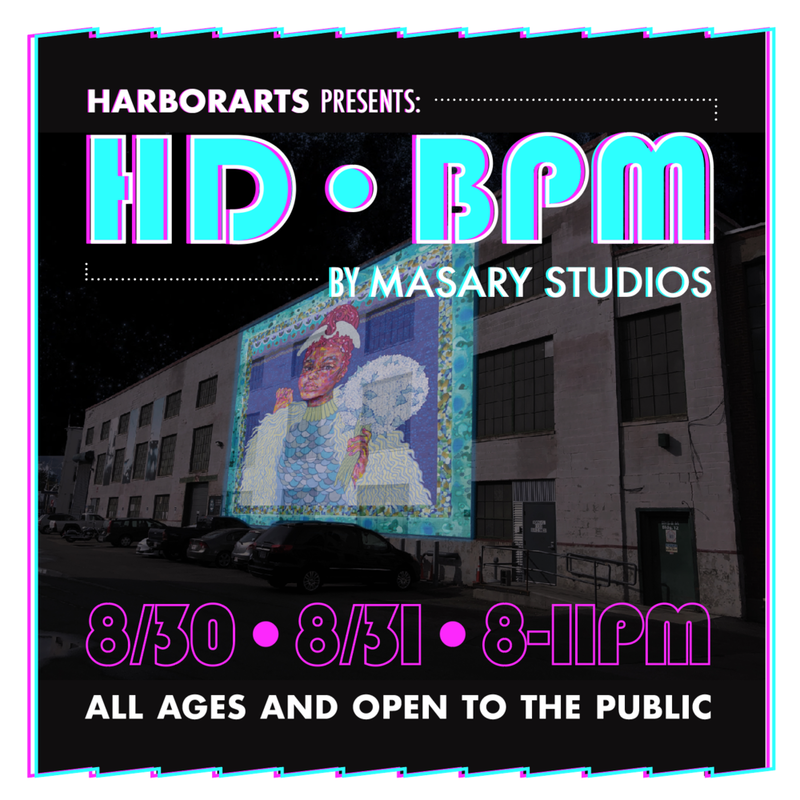 The following post was written and contributed to our blog by artist Ryan Edwards, reflecting on the process of creating his Public Art Accelerator project, HD•BPM, which will debut at the shipyard in East Boston on August 30th and 31st. Public art cannot be finished, it can only be prepared. And today, just one week before my piece HD•BPM is set to launch, I am deep in preparations. It is an exciting process, from ideas (plural), to idea, to “really is this a good idea?”, to “how are going to approach making this thing”… to then starting to make it. The current project involves putting drum sticks in the hands of the public and inviting them to play electronic drums pads, of which there are 9. Each stroke of a drum pad triggers a musical sound sample, and it also slowly reveals, stroke by stroke, video projected images of artworks on the side of a building in the East Boston Shipyard. Every drum stroke calls up a kind of animated tiled reveal, organized by color, in the projection. After hundreds of drum strokes, the artworks will be revealed in huge form on the side of an industrial building. The project addresses my interest in colliding sound with light / images / forms and plays with the idea of a drum stroke = a brush stroke. It also addresses one of my favorite things - putting music-making in the hands of regular people, helping them find their musical voice, and making that happen without the stress and strain of lessons or rehearsals. We can make music right now and it can sound good. I am fascinated by the idea that a true public piece of work must leave room for the public - it must be unfinished in someway. Whether that is space left for interaction, for footsteps, for ambient sounds, for data input, for weather, or anything - it is unfinished until it is realized in the wild. This project has certain determined aspects - the artworks that will be revealed through the music (7 pieces from local artists), the sound that will be triggered through the playing, and the software we created to make it run. But if we set this up in the shipyard, and no public hands grabbed sticks, no funky ideas came through, no one was bold enough to step up and play, then this artwork would not only be unfinished, it would not exist. The Public Art Accelerator Program was deeply valuable and enriching to me and my practice. My understanding of Boston and our public art history has deepened, and I am more confident to see myself in this city’s shared creative landscape. I will look forward to offering another blog post after my piece has debuted and share what worked, what the surprises were, what I learned, and what new spaces I might want to leave open for next time. Ryan Edwards of Masary Studios developed HD•BPM as a fellow of the Now + There Public Art Accelerator. Masary works to awaken the built environment through musical performance, projected video and interactive installations. Ryan is trained as a drummer, holds a degree from Berklee College of Music and spent much of his 20’s playing djembe in West Africa. He has written extensively for dance and is interested in the intersection of sound and physical forms. Ryan is a father and lives with his son in Watertown, MA.